What about patch repair? When your driveway cracks have been neglected too long, they begin to crack in several directions. We refer to this as “alligatoring.” Areas that are alligatored if left un repaired will turn into the a pothole that will need to be patched. These areas cannot be fixed with hot crack filler because they shift too much under heavy traffic loads and tear the rubberized filler away. These areas must be patched. 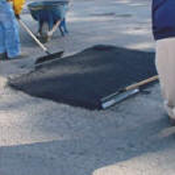 To properly patch a hole, you must first cut out all affected areas, level and compact a base of crushed rock, and then apply a tack coat to the edges around the area to be patched. Next, we fill it with fresh, hot asphalt and properly compact the area. Finally, we seal the edges to keep the moisture out.